Q: How do you know someone is training for a marathon? The runner who is training for a marathon will probably talk about their long run — because everyone knows that the long run is key to marathon training. They might also talk about their weekly mileage, because let’s face it, saying something like, “I ran 45 miles this week” tends to impress. Recovery. Moving (vs sitting on the couch all day) is said to cause increased blood flow to the extremities, which facilitates easier delivery of nutrients to the muscles, which aids in recovery. Boom. Mental toughness. Chances are, the last thing you want to do the day after a 16- or 20-miler is get out and run some more. This is especially true for those who are not used to it. So, do it anyway. Prove to yourself that you can, and in the last four miles of that marathon, remember all those times when you did! Endurance. Imagine your leg muscles as a piece of stretchy fabric. On your long run day, you stretch and release, stretch and release, and stretch and release this fabric for several hours, creating multiple tiny tears in it. But not to worry, it is a magical, self-repairing fabric – it just needs a few days of lighter stretching or rest and it’ll be good as new, even stronger. What happens if you run the day after your long run? You will still stretch and release your magical fabric, but because many of its fibers will still be torn, you will have to use additional ones for that particular job. By running on the day after a long run, you teach your brain to recruit muscle fibers that were not used in your long run. Specifically, it can now work on recruiting intermediate fast-twitch fibers, or Type IIa fibers, to pitch in and help do the work of slow-twitch or Type I muscle fibers during long-distance events. Those come in handy in the last miles of a marathon! On the day after your long run, get out for anywhere between three and six super-easy paced recovery miles. The benefits of two-a-days are similar to those of running after your long run: added endurance, mental strength, and not least – it’s a way to add more time on feet as you work on building your total mileage. The first run, preferably in the morning and typically 40 to 60 minutes long (but could be longer, depending on total weekly mileage), is a structured progression or negative-split run. Put your legs through the paces, starting at an easy warmup pace for 15 minutes, then pick it up each 10-15 minutes, running the last block at a pace that feels hard. The second run, at least several hours later and preferably in the evening, is a super easy-pace short run. Just get out there and run on dead legs. Alternatively, run a fartlek in the morning and a shorter, easy recovery run in the evening. The first run is usually harder, but not as hard a workout as, say, mile repeats on the track or a tempo run. Assuming that you are going out to run a distance that you have built up to already – i.e. if you have a 16-mile run on your schedule, this is not your first time in a training cycle running 16 miles – add some short fast-pace intervals in the beginning and towards the end of the run. 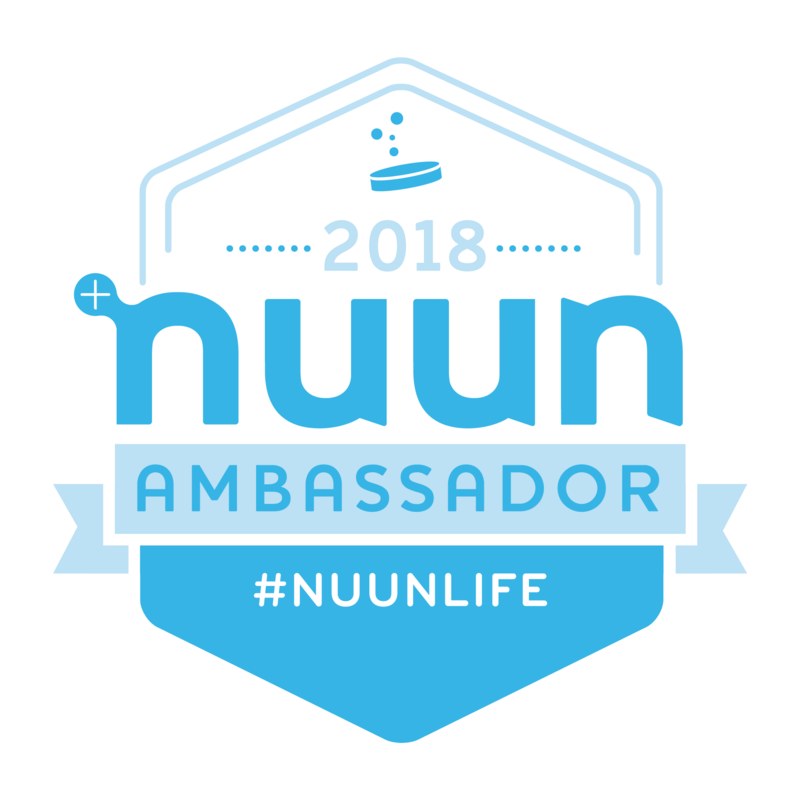 Benefits include recruiting different and more muscle fibers, working on mental toughness, and emulating what the last few miles of a marathon feel like. Break up your long run into four parts. The first is a two or three-mile warmup at an easy pace. The second part is four to five intervals of five minutes running at threshold pace (a pace you could sustain in training for 20-30 minutes, but hardly longer), with two-to-three minutes of easy pace in between. 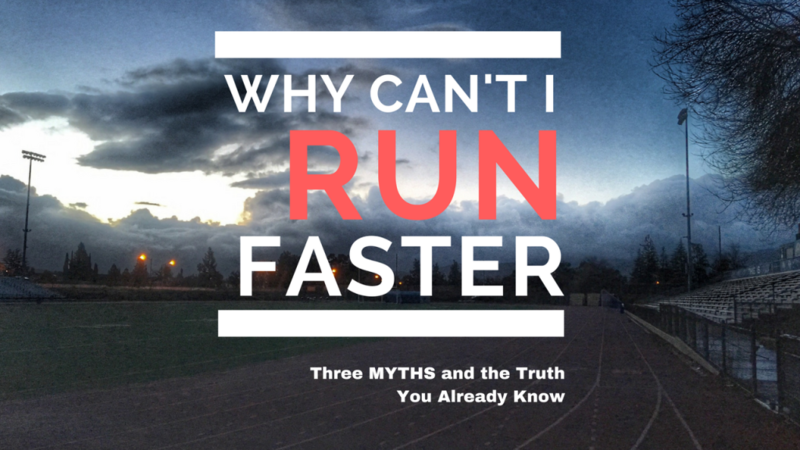 The third part is even-pace running at your typical long-run pace, and the fourth part is another block at four to five times threshold intervals with recovery. The last recovery interval can be longer, 10 to 15 minutes, and you’re done. Assuming you do this on runs of 16 miles or longer, you better believe that the second threshold intervals block will feel similar to miles 22 to 26 of your marathon! 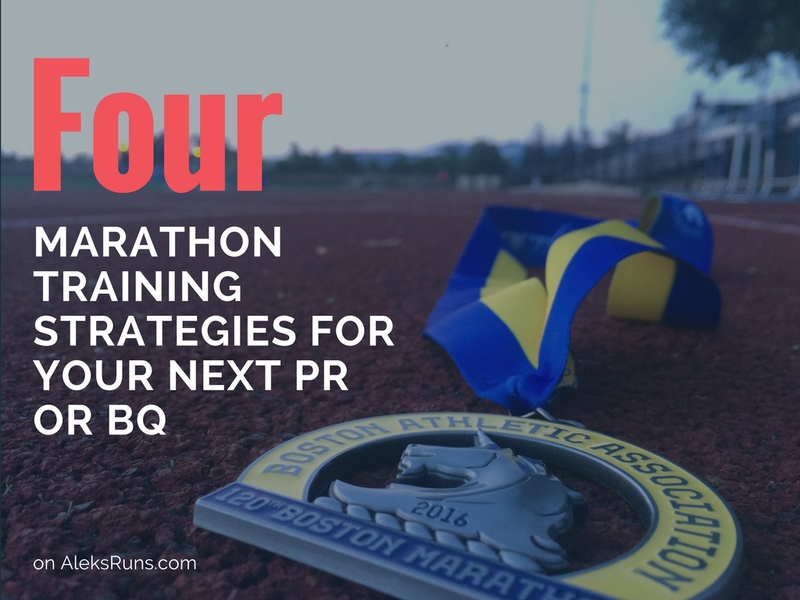 Alternatively, instead of fast and short threshold intervals, add some two- to three-mile blocks at or slightly below race pace, with a mile recovery at easy pace in between. It’s a way to practice race pace in a safer way than doing it in 10-mile or longer chunks of your long run, which might challenge you too much and compromise recovery. 4. Never neglect the good old boring easy run. There is nothing special or complicated about the easy run, yet many people neglect it and run all or most of their runs harder than they should. So it is worth saying this time and again: running easy will not slow you down! On the contrary, slowing down might just make you faster, because it will give you more adequate time to recover. This way, you can put in the hard work where it matters: the long run, the tempo run, the progression run, the hill repeats. In between these workouts, run slow and easy, keep that blood circulating round your legs, but don’t beat them up — you’ll need them later. And that’s about it: four marathon training principles that can help you step up your game. 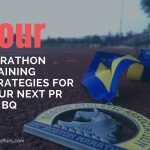 Train with purpose, race with heart – and go get that PR! 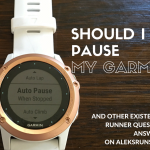 To pause, or not to pause my Garmin if I have to stop mid-run? 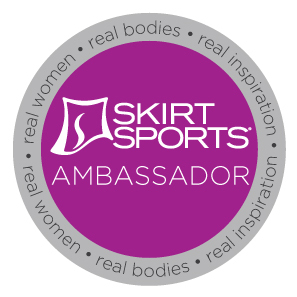 Red lights, water breaks, bathroom stops, fix-the-wedgie stops: they add up. The longer you’re out there running, chances are, the more time you’re spending at rest. The thing is, this route is an out-and-back that goes through a total of three red lights, including a very busy intersection (typical wait time: two to four minutes), and two road crossings where drivers don’t watch for runners dashing out of the park trail, so you better look twice before you do. And, in this case, I had one water stop and one bathroom stop. The result is a difference of nearly eight and a half minutes. Does that mean I nailed my paces, or not? 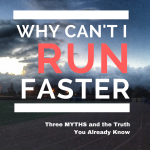 I actually asked my coach how he wants me to record my run times in my log – should I do moving time or total? – and he told me to do moving time for run and bike, and total for swim. I get it. Those are training runs (or rides), and they will be interrupted. You can’t beat yourself up for messing up the pace on Mile 15 because you had to wait at the red light for three minutes, and now it’s 11:30 instead of 8:30. Yes, you did take a break; yes, your heart rate went down – and yes, in a race, no one will stop the clock for you. For training runs, though, my philosophy (and I’m glad that my coach agrees!) is that it’s the movement that matters. Give the prescribed effort when you can, and if circumstances are forcing you to pause – pause your GPS, too, so you can keep accurate track of real effort, vs rest. Races, of course, are another story. I have heard of situations when things like a passing train or, recently, a gas leak (talk about danger of “blowing up”!) have caused course marshals to stop participants for anywhere from seconds to minutes. Later, the times are adjusted for the affected athletes. But in general – this seems so obvious, I feel silly saying it! – your net finish time is the time that it took you to get from the start to the finish. Do whatever you like in between – eat at each aid station, go porta-potty, take a nap – it is added to your net time. The timing chip don’t lie! As someone who qualified for the Boston Marathon with what ended up a meager eight-second cushion… I can’t tell you how well I understand that this is a fact. Which is why it boggles my mind to see some people reporting race finish times that are, in fact, the moving times on their Garmins or on Strava. The actual race result – the net time – is out there on the Internet, for everyone to see. Who are these people fooling, besides themselves? I, too, wish that moving time was the standard in race tracking. Wouldn’t it be great? You could take a five-minute break at an aid station, instead of rushing though and getting sticky electrolyte drink all over yourself. You could take a nap! Transition times would be scrapped from your total finish time in triathlon, and you could blow-dry your hair after the swim, and put on some lipstick before the run! Of course, that’s not how it works. For race results, moving time means zilch. 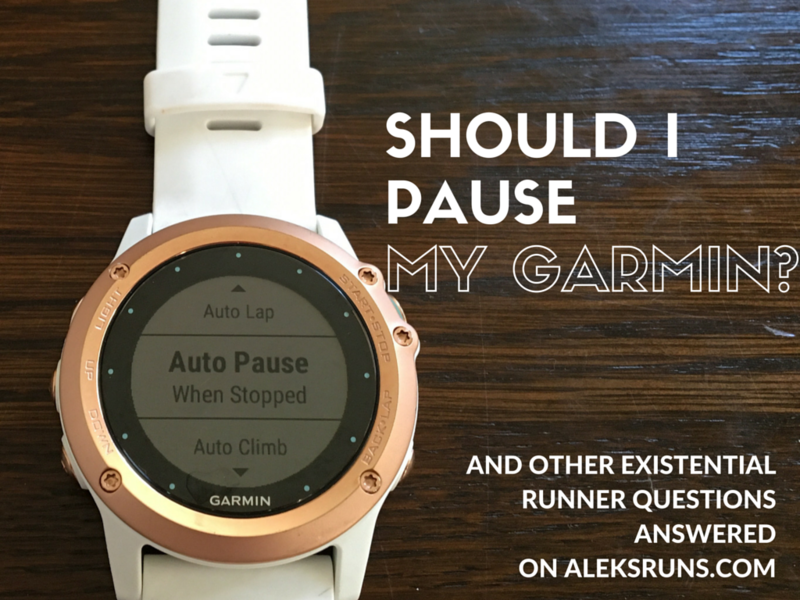 On training runs, sure: set up your Garmin on auto pause. Granted, if you run 10 miles at a 7:30 average pace, but take 5 minutes standing rest after each mile… well, that’s quite a different effort than running 10 miles at a 7:30 pace without stopping. If the goal was the latter, then you cheated yourself. But for most runs, go ahead and let your timer stop at that red light or water fountain break. As long as you’re not doing it in the middle of what needs to be hard work and, in this way, consistently jeopardizing the work, you’ll be OK. And if you are doing that auto-pause a bit too much, too long, then don’t expect those training paces to manifest themselves in a race. Do the work. See the real results. Don’t lie to yourself (and others) about your results. Few will be fooled. Most importantly, though, have fun running and racing! Isn’t that why we do it, after all?